Best of all, my schedule stayed full of great paying work, week in and week out, for over 2 years. 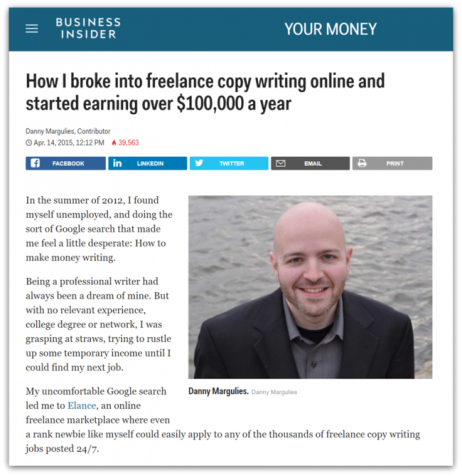 Yes, thanks to Upwork, I managed to totally escape that nasty "feast or famine" cycle that most freelancers find themselves trapped in. 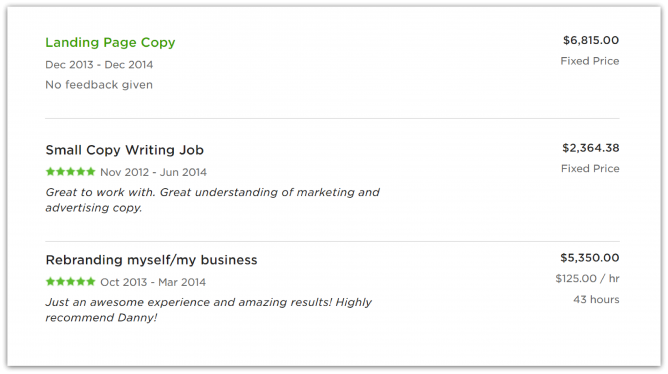 See how I charge more than my competitors on Upwork, without being especially talented or having credentials. Find out why I want some clients to choose my competition over me, why clients don't want to hear about how good you are, and more. In this exclusive interview, entrepreneur and longtime Upwork client Chris Davis and I dive deep into the psychology of what it takes to win over the best clients on Upwork. In addition to being a client of mine, Chris also made a living selling websites he built for up to 10x what many of his competitors charged. Chris and I go over the exact step-by-step sales process I used to sign him as a $135/hr. client, the psychological barriers that prevent freelancers from charging what they're worth (and how to get past them), what to do when clients ask you for "guaranteed results," the counterintuitive qualities that high-end clients really look for in a freelancer (hint: it's not what 99.9% of freelancers think), getting upfront deposits from clients, and much more. I've been getting premium Upwork clients to come to me for years. Find out why some of the top clients don't post public jobs, how to get found by them when they search for freelancers, and how to make your profile irresistible to them so they invite you to their job. I'll show you the 7 ways most freelancers mess this up (even the Old Pros who should know better, but don't). And I'll give you a framework you can use to make your profile "sticky" (even if you're brand new). Learn the surprising science of how to win clients' trust instantaneously, with minimal effort. See why this impacts how many jobs you get, how much you're able to charge, and even how happy clients are with your work. 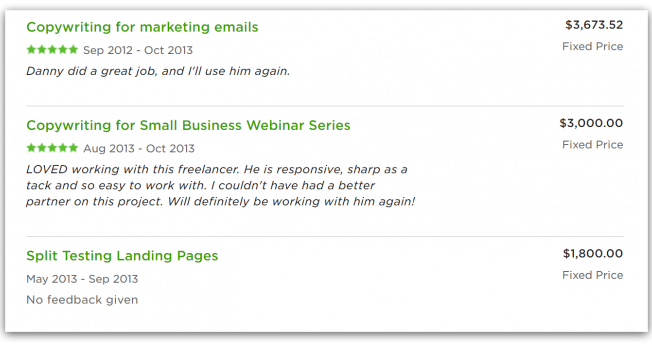 You have3 seconds to stand out from the crowd and get noticed by clients on Upwork. Watch me do a live coaching session with an actual SSFU student (Beth H.). In this first half, I help Beth strategically reposition herself and her Upwork profile to attract premium clients and triple her hourly rate. Time to take the guessing out of proposal writing. Learn my 4-step framework for writing proposals that WORK. This approach flies in the face of conventional wisdom, yet I've successfully used and taught my method to thousands of people, including some of the most successful freelancers on Upwork. See how I've consistently won jobs with over 70 applicants! Get tactics for influencing clients to hire you in just about any situation, without ever sounding "salesy." Learn my "Pepperoni Pizza Approach" for getting clients excited about working with you. Use my simple system for determining what to keep in your proposal, and what to delete. And more. 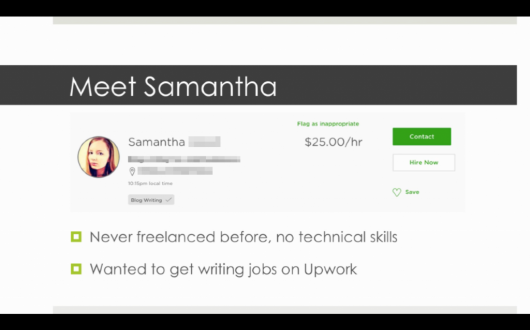 Get access to over 50+ examples of real Upwork proposals that got real results. This is an invaluable, one of a kind resource that's not available anywhere else online. 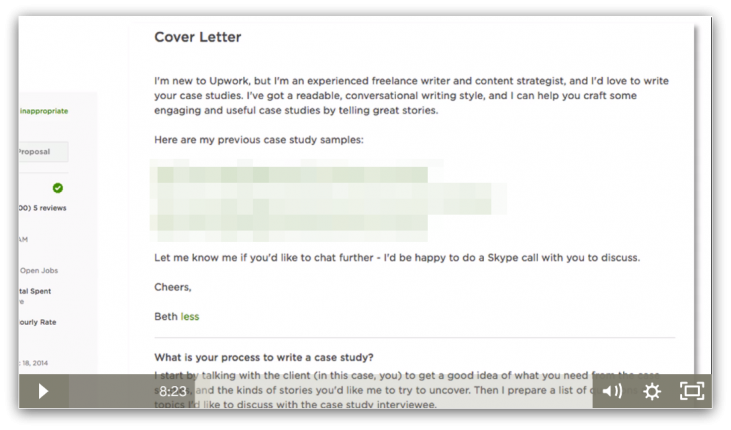 It took me years to build a huge collection of real winning proposals from various industries and niches, so you can see EXACTLY what approaches work for some of Upwork’s top freelancers -- regardless of your background. In this follow up session, watch me help Beth fix her Upwork proposals on the spot, making them 10x better. Get my formula for turning clients into repeat customers, so I could stay busy month after month, making money without having to spend valuable time looking for new work. In this video, I'll walk you through the advanced negotiation strategies I've used to consistently charge up to 20x what my competitors do. Learn scientifically based techniques, like my "Breadmaker Approach" for getting clients to say yes to your price quotes, and increasing clients' budgets through "freerolling." In this private audio call, Jake and I open up about the winning online-freelancing approaches we've been using for years. Topics covered include winning jobs with lots of applicants, building new skills quickly, how to project authority regardless of your experience level, building momentum, how I choose which freelancers to hire, strengthening your client relationships, hourly vs. fixed fees (and why everyone gets this wrong), how to get clients to pay for an initial consultation, and more. I look it over carefully, then offer a few specific, actionable tips for making it 10 times better. You quickly revise it to incorporate my suggestions, and, within minutes, get an excited response from the client, which leads to an exciting offer to hire you! If you join Secrets Of A Six-Figure Upworker this week, I'll personally review one of your proposals, and give you detailed feedback on exactly what you've done well, as well as specific, actionable advice on what else to include (or exclude), where you can improve, and exactly how to do it. In addition to personally reviewing one of your proposals and giving you actionable advice on how to make it even better, I'll also personally review your Upwork profile, and let you know exactly how you can improve it to attract personalized invites from awesome clients who will be champing at the bit to hire you. Many people think I'm crazy to offer these bonuses in the first place since it's going to require a lot of work on my part, and I may never offer them again. Business and marketing experts tell me I should focus my time on selling more courses and making more money -- not reviewing Upwork profiles from Secrets Of A Six-Figure Upworker students and giving personalized feedback on each one. But I believe in going the extra mile to help my students set themselves up for success. That is why I've decided to offer these bonuses -- at no extra charge, no less. If I wanted to I could easily create an upsell for these bonuses and charge more for them -- they are easily worth hundreds if not thousands of dollars. But I'm throwing them in, at least for anyone who joins Secrets Of A Six-Figure Upworker this week, as part of my commitment to helping you succeed. Mind you I'm not sure if I'll ever offer these bonuses again. But if you join this week you'll get it, at zero additional cost beyond the price of the course. Which I think is a great offer, especially when you consider that I don't even offer this as a paid service (even though there is a lot of demand and people are willing to pay very well for it, I just don't have the time to do it for everyone). I know the strategies in this course work. They've worked for me over and over again throughout the years. And I've seen them work for my students, too -- both new and experienced freelancers alike. If it doesn't work for you, you don't have to pay. Why should you? Absolutely not. Many different types of freelancers have taken the course and successfully used these strategies. Similarly, the strategies can work for freelancers in any Upwork category, including graphic designers, transcriptionists, web developers, IT and engineering professionals, consultants, translators, and more. The skills I teach are designed to win on Upwork across all categories. That's exactly the point of this course! I want you to spend less time looking for clients, not more. The approaches I teach are designed to help you get results without having to spend hours on end looking for new clients. If you're someone who hates having to constantly market and sell yourself online (Upwork included) then this course might be a good fit for you. Yes. Whenever the course is updated, you'll immediately get access to any and all updates instantly at no additional charge. I've already updated the course several times, adding more content, tools and resources to help you win. "I have passed from being a jobless Venezuelan immigrant in Spain (where the job market is really FUBAR) to being a full-time freelance translator, having found jobs thanks to the Upwork+Danny combo, and being able to support my family without worrying about if there is a job available for me or not. And by the way, I had no formal training as a translator! I'm actually a Chemical Engineer with 10 years of experience running my own (Paints&Lacquers) business. I had never ever been a translator before in my whole life! Talk about starting from scratch! But thanks to your course and excellent advice, I have been able to carve myself a place in the English-Spanish translation arena. I have passed from my profile not showing at all in Upwork, to being the #6 translator that appears when you browse Upwork by "translation", and the #2 in English-to-Spanish translation!! Hidden economy kicked in about 3 months from the start. I have you to thank for that. Also, the profile and proposals evaluation-critiques are beyond the scale!!" "I've had access to your course for I believe almost two weeks now and I've already raised my rate from $65/hr to $100/hr and I've landed two jobs today at my new rate!! I've been in talks with more people this week than I have in the first three months of my freelancing career." "Your Six-Figure Upworker course is magic and I've been getting weekly invitations since I tweaked my profile based on your lessons."